Jay Jay Café is a locally owned and operated café “chain” if you can call it that. Jay Jay has a total of three locations in the City of Arlington, Texas: 518 N. Fielder Plaza, 1001 S. Bowen and this newest location at 4401 Little Road. The formula is simple: take over a formerly occupied space, clean it up and offer patrons a standard menu of home cooking for a good price for breakfast, lunch and dinner. We popped in for breakfast around 8:45AM on a lazy Sunday morning (opening day was Friday so bear in mind they are just getting started) and we were quickly and cheerfully greeted by our hostess. Quickly shown to a table of our choosing in the upper dining area the restaurant quickly filled in around us as our meal progressed: a great sign that we love to see. Another locally owned and operated restaurant being supported by the local community. I opted for the ABC Omelet ($7.69) for my breakfast. 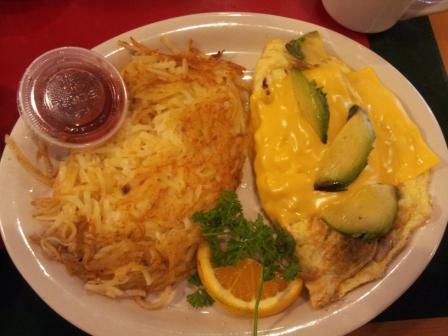 This omelet consists of avocado, bacon, American cheese, onions and mushrooms. It was serviceable albeit a bit pedestrian. I would substitute cheddar for the American cheese and that should perk it up a bit. I’d also substitute the grits (a personal favorite) for the hash browns; the hash browns didn’t do a lot for me. Your choice of toast is also included. The menu is fairly extensive so pop in several times for lunch is my recommendation. That’ll give you the opportunity to sample various items and form a better opinion. I plan to do so over the coming weeks and look forward to posting updates. Something that is really nice is Jay Jay Café bakes pies fresh daily. I really love having a local restaurant available where I can quickly pop in and pick up a freshly baked pie for family occasions. Matter of fact, we picked up a German Chocolate Cream Pie after breakfast and brought it home to sample later. Jay Jay Café is open seven days a week for breakfast, lunch and dinner. They close early on Sundays. Attire is casual: shorts and a t-shirt get the job done. Reservations are not needed. Parking is free in the adjoining lot. Major credit cards are accepted. Jay Jay Café III: basic home cooking at a fair price; nothing more, nothing less.